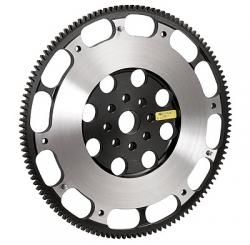 ACT's Streetlite flywheel, which is considerably lighter than stock and is the most durable flywheel offered by ACT, and is perfect for street or track use. The materials used to construct the flywheel are properly distributed for maximum strength, lower inertia, good heat tolerance and rigidity. ACT's Prolite flywheel is the lightest flywheel available, with the lowest inertia, and is designed specifically for the best throttle response and acceleration. The material used to construct the Prolite flywheel are properly distributed for maximum strength, lower inertia, and good heat tolerance and rigidity. The Prolite flywheel is recommended for high horsepower race use only. ACT flywheels are serviceable and can be resurfaced with no need to purchase additional parts. *The Prolite flywheel option is recommended for high horsepower race use only.